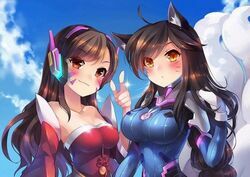 A collection of pictures featuring both D.Va (Hana Song) and Ahri from Overwatch and LoL respectively. - This pool is NOT making aesthetic judgements as there are few enough of these pictures. - The focus of the picture/animation should be on D.Va and Ahri or at least them being seen together, ideally touching or in physical proximity. Rules are not interpreted strictly and only a guidance.